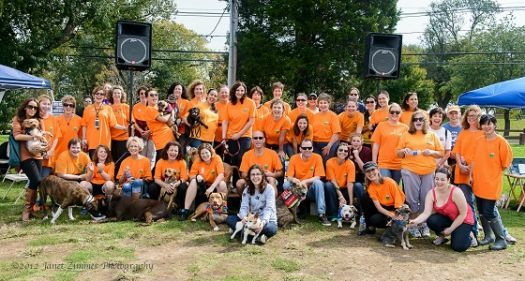 On Saturday, October 6, under a beautiful blue sky the Pet Animal Welfare Society celebrated its 50th anniversary with over 1000 participants and their dogs at Taylor Farm Park at Calf Pasture Beach in Norwalk. A special VIP area for PAWS volunteers current and past provided special treats and over forty exhibitors gave away all sorts of free gifts and provided services to all participants. The event was opened with a greeting from Norwalk Mayor Moccia and concluded with a heartfelt statement by Senator Bob Duff. Volunteers over the ages were invited to be part of a group photo. Graduates of PAWS - animals that were adopted this year - were called to the stage for a group photo as well. Hairy Barker Inn & Spa in Darien provided mini makeovers with the assistance of Rita Chu and teams of volunteers. A jungle themed cat tent featured adoptable cats for viewing and mini info sessions on clicker training for cats. Micro-chipping for dogs was offered. Heritage Hobbies demonstrated hi speed radio controlled boating down at the waterfront. Best Friends had their dog treat truck on-site and Bliss Ice Cream had dog bone shaped ice cream - all for dogs. People dined on Jr's Hot Dogs and gourmet grilled cheese from the Melt Mobile. Children added their artful images to the Doodle Roll project "What does a pet mean to you?" which will be displayed in the lobby of PAWS. Norwalk K9 police did demonstrations, the Animal Control truck was there for people to see and humans learned how to get fit with their pets in the Reshape with Patrick program. Agility equipment offered guests an opportunity to see if their dogs would enjoy agility activities. And Pet Playgroundz hosted high flying Frisbee demonstrations while teaching people how to train their dog to catch! Through pre-event fundraising by volunteers, raffle sales, advertisers in the commemorative journal (designed by Conceptual Imagery), donations made by exhibitors and vendors, plus the generous support of sponsors Big Dogs, The Walking Company, TD Bank, Choice Pet Supply, Blue Buffalo, Canine Companies, Hearst Media, 95.9 The Fox and Moffly Media, PAWS was able to raise money to help more animals at the shelter and in the community. Donations can still be made at www.pawsct.org.Visitors are welcome to the shelter to see the wonderful adoptable pets or to volunteer with dog and cat care activities. Contact the shelter at (203) 750-9572 for further details and visiting schedules. © Copyright by NorwalkPlus.com. Some articles and pictures posted on our website, as indicated by their bylines, were submitted as press releases and do not necessarily reflect the position and opinion of NorwalkPlus.com, Norwalk Plus magazine, Canaiden LLC or any of its associated entities. Articles may have been edited for brevity and grammar.